Every few months or so, I find myself in some type of a guitar playing slump, or rut or whatever you want to call it. If you’ve been playing guitar for longer than a few years, you probably know what I’m talking about right? Things I normally can play with ease become a little sloppy or my hands feel out of sync. After 30 years and thousands of gigs, it wears on you a bit. I just got off a busy month of 5 and 6 gigs per week in October and a steady 5 per week in November thus far. As I’m writing this, I’m enjoying 3 days off… in a row! My first stretch of 2+ days off since June. Hey, I’m not complaining… being a working Guitarist for a living is probably about the best thing ever.. but it can be a bit tedious sometimes. When I get into full-on gig mode, changing up my practice routine is essential to getting out of a playing rut. 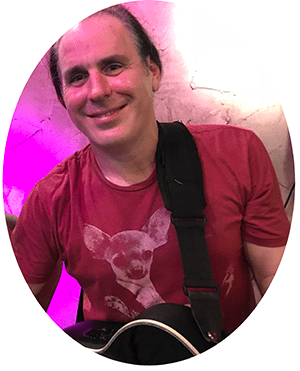 If you’ve ever been to this website or read any of my stuff before, you’ve probably seen me talking about my Guitar Practice routines. 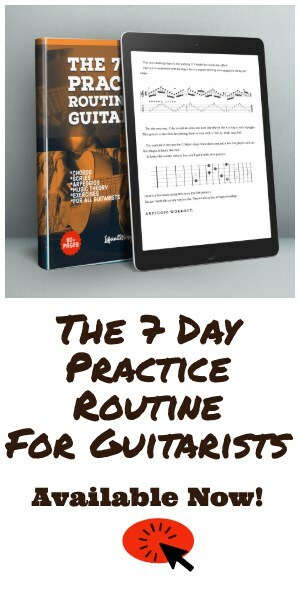 I even wrote a book: The 7 Day Practice Routine For Guitarists. Look, I take this stuff seriously. If you’re reading this, I’m guessing you probably do too… and good for you! Sometimes I find that really going back to the basics is just the thing to jumpstart my hands. Being an 80’s influenced guitarist, the basics for me are scale and arpeggio sequences using (mostly) strict alternate picking. 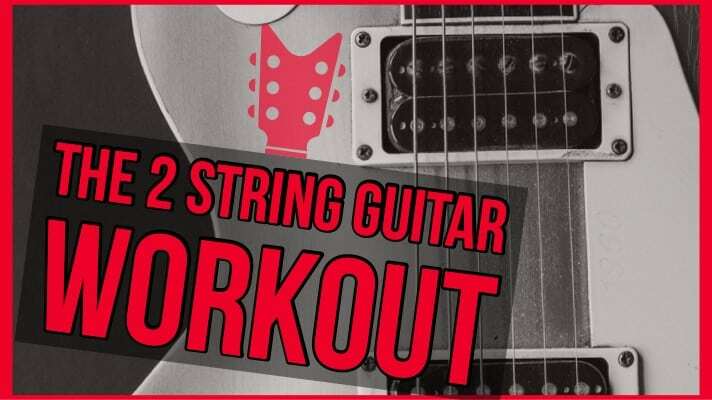 In this article, I’m going to focus on just 2 strings for this guitar practice routine. Yes, I said 2 strings. As guitarists, we’re playing rhythm about 98% of the time. Banging away on those low strings can take its toll on your technique especially if you play Acoustic, Rock or Funk. Your strumming and rhythm technique is light years away from your lead stuff. 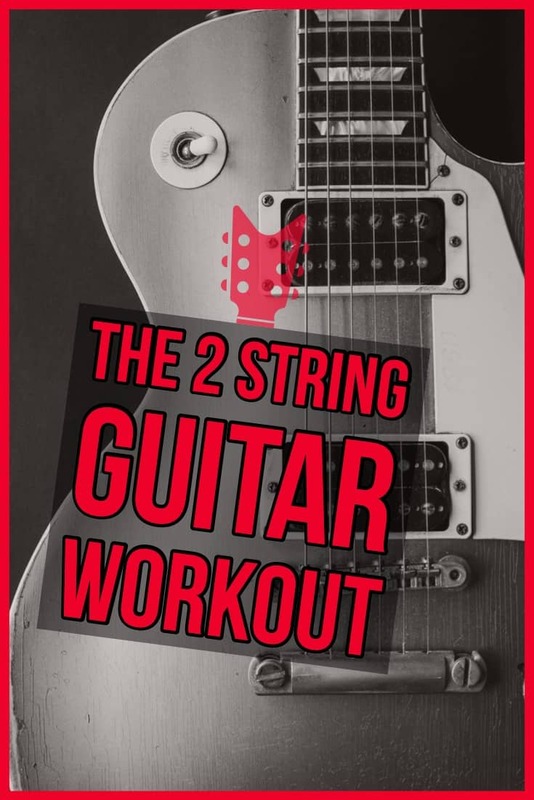 I’ve put together a routine on the 2 high strings that has helped me a lot. By focusing on the B and high E, we can fine-tune those lead picking chops while giving that rhythm arm a bit of a break. If you’ve read any of my other guitar practice routines, you know I’m big on technique. I’m not talking about speed necessarily.. just good solid technique that builds a foundation for everything you play on the guitar. The technique makes everything easier. The speed occurs as a by-product of practicing well, SLOWLY. Ok.. let’s get to it! If that scale is new to you, that’s ok, maybe jump over to my Guitar Scales article where I go into the theory in depth. This is one of my favorites to start with because it’s so good at syncing both hands and warming up. In ex. 1 we’re starting on the first available note on the high-E string (F#) in the key of G and building a 3 note sequence ascending. The first 4 groupings of 3 notes (F#, G, A) are played in a 4/4 feel then sped up to a fast 6/8 feel at the end for the last two. Speed bursts are en excellent chops builder and really help with syncing the picking and fretting hands. We’ll then reverse it and do the same sequence descending. In ex. 2 we’re doing a modification to the sequence. Start on an upstroke (pinky on 5th fret), back to F# on a downstroke, then an up & back type sequence. You’ll see licks like this a lot in classical violin music. That screenshot was taken starting on the C note and continuing ascending through the scale. I’ve optimized and trimmed the graphics for this article, but the full practice routine is 6 pages long. If you’d like the full routine in a 6 page high-quality, printable PDF, signup below and I’ll send you the sheet music. These are so fun and so incredibly beneficial to both hands. If you’re into Baroque era music or 80’s Neo-Classical Shred Guitar playing, then you’ve probably heard these before. “In music, a pedal point is a sustained tone, typically in the bass, during which at least one foreign, diatonic or dissonant harmony is sounded in the other parts. Regardless, they are a ton of fun on the guitar and a serious workout for both hands no matter what kind of music you’re into. In ex. 4, starting on the C note (1st finger, 1st fret, B String) we’re building a pedal point diatonically and moving the sequence up the neck in the key of G.
In ex. 5, we’re going to take it to the next level for all of you advanced shredders out there. Grande Pedal Points! Watch the stretching. If it hurts. Stop! The first finger is doing most of the traveling. Use your pinky as the positional guide and let your first finger float through the pedal. Always alternate pick. the upstroke can seem awkward when crossing strings. Pay attention to that right hand. In the next section, we’re going to switch it up again by using hammer-ons and pull-offs through the 2-string scale sequence then repeat the same notes using strict alternate picking. This one is tricky. Take it slow and use a metronome if you have one handy. Two downstrokes and a pull-off. That’s it! A really simple, yet effective exercise. In ex. 8, the root is again on the B string. The first arpeggio (D7) starts on the 5th degree (A) and descends down to the 7th and back up again. Getting tired yet? I didn’t think so! …here are a few variations I like to do in 6/8 and 5/8 respectively. Remember, the FULL Routine is available for free in a high-quality 6 page .PDF File. Just hop onto my email list. You can unsubscribe anytime. Reminiscent of Zakk Wylde.. who seems to really like this lick because he does it on just about everything he’s ever recorded.. we’re taking the same idea and applying it to the E minor or G Major Pentatonic scale. Whether you call it E minor or G Major is just a matter of which notes you’re focusing on or what chords you’re soloing over. In ex. 11 we’re playing the same pentatonic scale notes but in 5/8 ala Eric Johnson. I remember learning Cliffs of Dover when I was about 19 and it blew my mind. I’d never heard anyone play pentatonics like that. Eric Johnson plays 5’s like most people play 6’s. That’s really the key to this lick. Play 5 but feel it like 6. The tricky part is the change of pick strokes because of the odd-number of notes. It takes a bit of work, but worth the payoff. How do your hands feel? I did this whole sequence earlier this afternoon before I wrote the music out and later this article… I gotta tell ya… it’s super effective. My hands, while a little fatigued felt really strong by the end. There’s one more sequence you can see in the full PDF routine. I had to hold something back.. and this article is LONG enough I think. I’ve got one more day off before my gig Wednesday, then, of course, I’m booked through the weekend. I think I’m gonna have a really good playing week because of this. P.S. 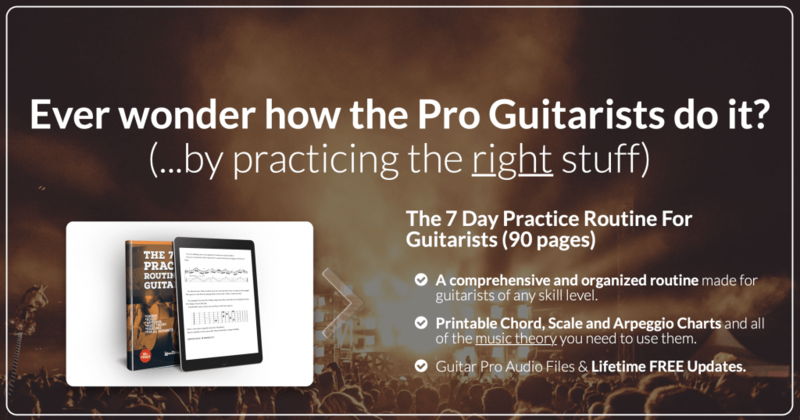 – If you liked this article, you may like my 90 page guitar practice routine book: The 7 Day Practice Routine For Guitarists. Check it out and read what guitarists are saying about it.